At a time when computers are more widespread than ever, intelligent interactive systems have become a necessity. The term ‘multimedia systems’ refers to the coordinated storage, processing, transmission and retrieval of multiple forms of information, such as audio, image, video, animation, graphics and text. The growth of multimedia services has been exponential, as technological progress keeps up with the consumer’s need for content. The solution of 'one fits all' is no longer appropriate for the wide ranges of users with various backgrounds and needs, so one important goal of many intelligent interactive systems is dynamic personalization and adaptivity to users. 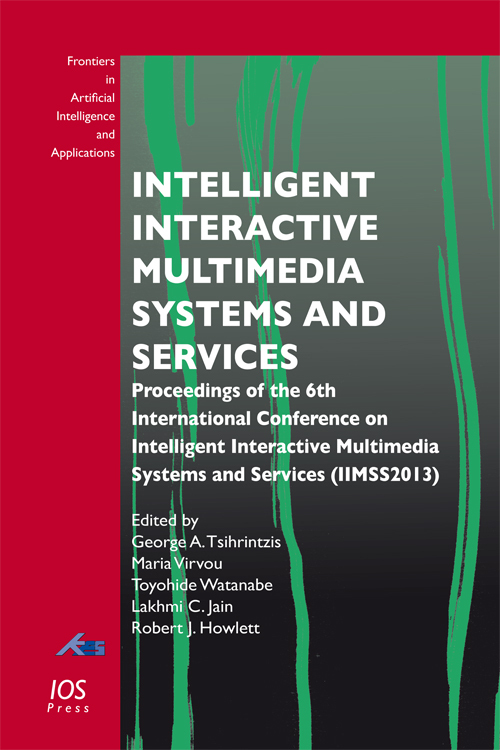 This book presents 37 papers summarizing the work and new research results presented at the 6th International Conference on Intelligent Interactive Multimedia Systems and Services (KES-IIMSS2013), held in Sesimbra, Portugal, in June 2013. The conference series focuses on research in the fields of intelligent interactive multimedia systems and services and provides an internationally respected forum for scientific research in related technologies and applications. Edited by: Tsihrintzis, G.A., Virvou, M., Watanabe, T., Jain, L.C., Howlett, R.J.